Vita 57 provides a mechanical standard for I/O mezzanine modules. 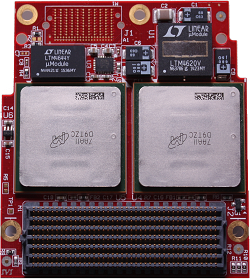 This standard introduces a methodology that shall allow the front panel IO of IEEE 1101 form factor cards to be configured via mezzanine boards. Vita 57 modules have fixed locations for serial/parallel IOs, clocks, Jtag signals, VCC, and GND. 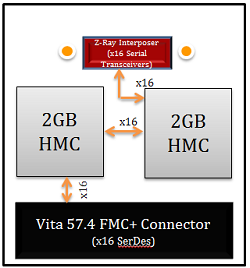 This Vita57.4 compliant FMC+ module is supported by one or two Micron 2GB Hybrid Memory Cube (HMC) device(s) supporting density of up to 4GB. 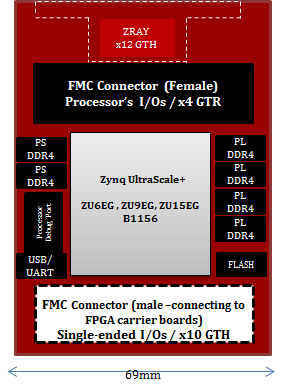 The module works only with FPGA carriers board supporting Vita57.4 ports (i.e. HTG-9100 , HTG-830 , HTG-828 , HTG-930, and HTG-847 ).